Your flagpole is an investment, and with proper care and maintenance, it can stay looking great for many years. A rule of thumb is to inspect your flagpole and its parts whenever you replace your flag. If flags are flown all year round, Piggotts Flags & Branding Limited recommend you change your flag every six months and at this point also carry out at least a visual inspection on your flagpole with a full inspection every 12 months. Flagpoles can be subjected to extreme weather that include high winds, extreme humidity or extreme cold. Now that spring is here, it’s a great time to do a little spring cleaning on your flagpole and accessories. Most aluminium flagpoles can be cleaned with mild soap and warm water. By simply attaching a soapy sponge to the halyard, you can clean the pole by raising and lowering the halyard with the sponge attached. If cleaning the flagpole requires more than soap and water, purchasing aluminium cleaner from your local car parts store will do the trick. Fibreglass flagpoles can be cleaned with a mild bathroom cleaner and water. Flagpoles with anodised finishes, such as clear, bronze or black, do not require cleaning. The anodised colour serves as a protective coating, and cleaning the surface can actually damage them and void the warranty. Weather can also affect the flagpole’s halyard. The cold weather can cause a halyard to degrade and dry-rot, while salt air can cause the halyard’s fibres to appear “rotted out”. Wind, rain, and humidity can stress the halyard and cause it to fray as well. Replacing the halyard needn’t require expensive equipment, a great tip is to just tape the end of the new halyard to the old one and pull it up the flagpole and through the truck’s pulley. A little tape around a frayed halyard end will help it pass through the truck’s pulley smoothly. Be sure not to overlap the two ends or use an excessive, bulky amount of tape. You want the rope to glide through the pulley easily. You can action all of this yourselves but Piggotts Flags & Branding Limited can also carry out this service for you and provide you with a written safety inspection sheet that is valid for 12 months. Please review our maintenance and inspections sections here. 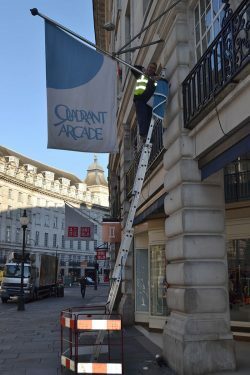 https://piggotts.co.uk/flag-maintenance/ and please feel free to contact us where one of our professionals will discuss your requirements and arrange a visit.